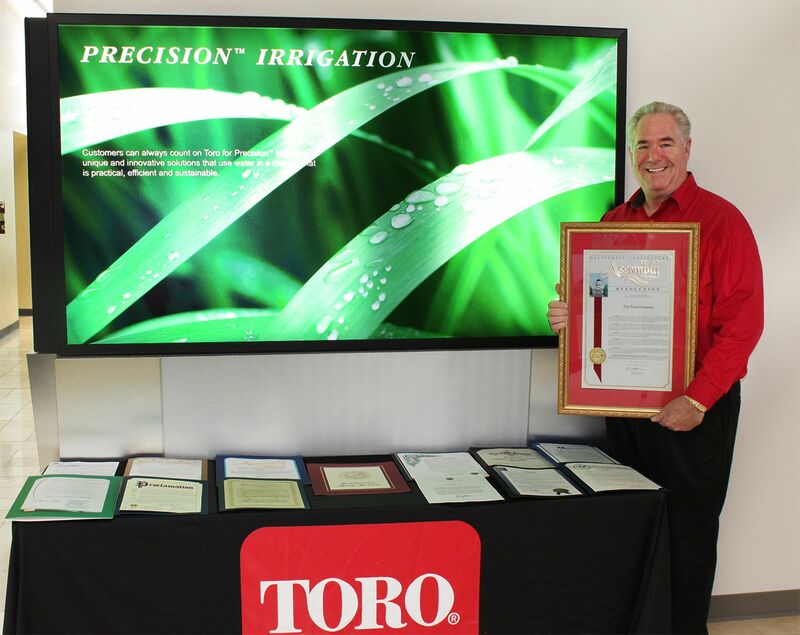 On behalf of Toro, Robert Starr, of the company’s water management group, is recognized for promoting ‘Smart Irrigation Month.’ Photo: Toro. Eric Linder, representing the 60th Assembly District in California, recognized The Toro Co. for promoting Smart Irrigation Month. For the first time since 2005, when the Irrigation Association (IA) launched Smart Irrigation Month, the governor issued a declaration recognizing July as Water Smart Month in the State of California. The intent, he said, was to help “increase water awareness throughout the state” and to “invite all Californians to practice more sustainable water consumption.” Toro partook in the effort to mark July as Smart Irrigation Month by reaching out to government agencies and elected officials at multiple levels. In total, Toro has proclaimed July as Smart Irrigation Month in three states (California, New Jersey and Oklahoma), eight cities and two water districts.